Google+ just got Google Translate features thanks to a Chrome extension, the news of which was posted on Google+ by Josh Estelle of Google and shared by Robert Scoble. 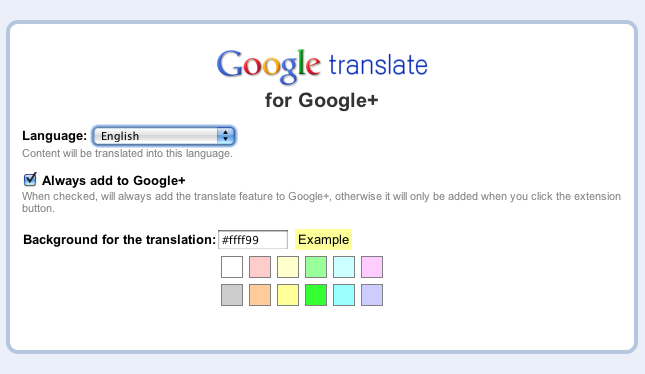 Scoble says that the feature ‘works great‘ and allows the translation of non-English content on Google+. To translate a Google+ post, just click the inline ‘Translate’ button directly below each post. This will translate and highlight the text for you. The button will change to a ‘Show Original’ option to allow you to revert it back. We’ve played around with the extension a bit and it definitely does work, offering the same quality of translation as you might get from passing a website through Google Translate. Which is to say, it works better sometimes than others and doesn’t translate context well. Still, the option is a very nice one to have and I love the inline positioning of it that allows you to toggle it on and off. There are a few options that allow you to choose which language to translate the post into, the extension supports a bunch, what color you’d like the highlight and whether you’d like the option inline or activated via the extension button. You can access the extension’s settings by visiting chrome://extensions/. The extension does not, however, allow you to translate comments, which would be a nice addition. Hopefully that will get added to a future version of the plugin or Google will just roll this functionality right into Google+. Update: Josh contacted me to let me know that the plugin does, in fact, work on comments as well. So thanks to Josh for that and for the plugin. You can download the extension here on the Chrome Web Store.